We always thrive to unfold different ways on how to be healthy and live longer. As human beings, it is our nature to venture into healthy food options and beneficial workout routines and activities that can give us a substantial boost. Acquiring a healthy body enables us to engage in everyday tasks without tiring ourselves too much and eventually drain the energy out. But as we get our eyes on strenuous activities and workout routines, we often conclude that achieving a healthy isn’t easy. However, maintaining a healthy body can actually be enjoyable and does not need to be entirely exhausting. Rebounding and jumping on a trampoline can surely be both fun and beneficial. Trampolining strengthens your body’s shield and might as well add a few cubits in your life span. It boosts the function of the lymphatic system. To boost the function of the lymphatic system is like having a very efficient drainage system in your house as well as very effective garbage collection and waste disposal. Truly, this system, if applied to your home, will promote good health and the best way of preventing diseases. But what does the lymphatic system do to our body? How can trampoline contribute in boosting its function? Well, this system plays a very important role in our immune system. It is composed of organized lymphatic vessels that carry fluids called lymph towards the human heart. The lymphatic system is primarily responsible of removing toxic waste from our body and maintaining a balance of the fluids in our immune system. If the lymphatic system does not function properly, your immune system will go low and the body’s defense against germs, viruses and other toxic waste will suffer. Compared with the cardiovascular system that relies upon the involuntary pumping of the heart, the lymphatic system highly depends on our body movements and muscular contraction to keep it going effectively. An effective form of exercise like rebounding on a trampoline will keep your lymphatic system working effectively. Body movements against gravity are the best contributory factors. The stronger the system through exercise, the more it functions productively and as a result, the healthier your body will have. According to popular macrobiotic researches, trampoline activities can increase the flow of the lymphatic system up to twenty times and better flow yields to a stronger immune system and optimum body health. It promotes healthy cardiovascular activity. Our cardiovascular system primarily depends on the natural pumping of the heart. Several cardiovascular exercises will help improve the heart rate like running, jogging, walking and other similar activities. While rebounding with the use of trampolines increases the functionality of the lymphatic system, it automatically increases blood circulation in our body. Such exercise will improve blood flow to prevent heart problems. According to the Journal of Applied Physiology of National Aeronautics and Space Administration or NASA, “Results indicate that the magnitude of the biomechanical stimuli is greater in trampoline jumping than in running, which finding could be of use in the design of procedures to avert reconditioning in persons exposed to weightlessness.” Therefore, bouncing and rebounding on exercise trampolines compared to running is more advantageous to physical health particularly to cardiovascular functions. While our body is naturally designed to run, it is unfortunately not designed to perform running on hard surfaces like concrete roads and sidewalks. Most individuals who run, jog or brisk walk may have the risk of injuries to their heels, knees and even to their hips going to their spine if left unchecked. That is why rebounding on trampolines is safer because the impact of your weight is not directed to your body parts or joints but is being absorbed by the trampoline itself. It strengthens the density of bones. According to National Aeronautics and Space Administration (NASA), astronauts suffer from a decrease in bone mass and bone density because of the effect of zero gravity situations in space. Since there is no need for strenuous bone activity and strength, bone density decreases. NASA’s experimental studies successfully conclude that trampoline exercise and activities are safe means to overcome bone problems. On the other hand, rebounding and bouncing on trampolines will reinforce the joints, strengthen the tendons and ligaments, and decrease the chance of osteoporosis and even arthritis and similar forms. It is also beneficial to most older aged individuals because it helps in strengthening the muscles without the effect of too much pressure that might harm brittle bones. It helps maintain a healthy weight. Moreover, according to the Journal of Applied Physiology of National Aeronautics and Space Administration or NASA, rebounding and bouncing activities with the use of trampolines are sixty-eight percent more efficient compared to running and jogging. NASA also proved that a person weighing an average of one hundred fifty pounds bouncing on a trampoline for one hour will surely burn an ample amount of calories which is far greater than those individuals jogging more one hour. Not to mention here the physical stress that may come as an effect to the pressures on the joints brought about by jogging on hard concreted pathways or roads. Moreover, cardiovascular exercises and activities during extended hours can lower the individual’s metabolism since this is the effect of prolonged periods of breathless activities. Contrary to cardio exercises, trampoline exercises and rebounding support metabolism as it increases blood flow and effectively helps the lymphatic system to work well. It is an enjoyable form of exercise. Everybody aims to have a healthy body and healthy lifestyle free from stress, sickness, and injuries. Balanced diet and exercise play vital roles in one’s optimum health. Exercise in particular if engaged carefully and with a professional guidance from physicians and experts will bring great benefits. Then there are trampoline exercises which will not only provide you with the safe exercise but also improved metabolism, will increase and boost your immune system, and most importantly, will provide you a more enjoyable way to be fit and healthy. Trampolines for kids and adults are available to let you and your family revel in the healthy benefits of rebounding. It can also be another great way to spend an enjoyable time with your family! Surely, trampoline exercises are enjoyable activities both for the young and the old. You may have been surprised with the numerous and outstanding health benefits of trampoline exercises like rebounding and bouncing. Engaging in and increasing your rebounding activities will also increase your benefits for sure. But of course, it is always best and recommended to consult your doctor and professional health care provider before engaging in any type of exercise and physical activity. 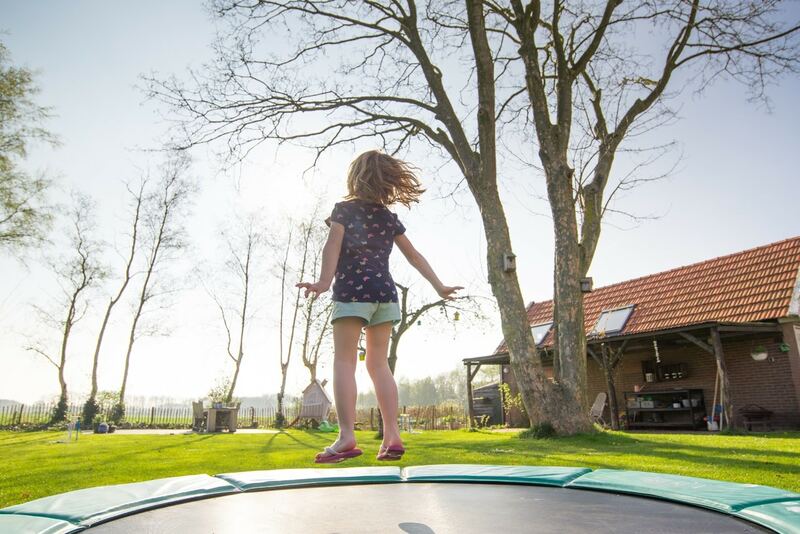 It is also recommended to invest in trampolines with sufficient padding and handlebars to protect yourself and your family members from hard metal parts. Handlebars will help you with your balance. You may consider installing safety nets to catch anybody falling from the trampoline. With all these information and recommendations in mind, you and your family are just a few bounces away for a healthy and longer life.